The pelt of this rascal might be regarded Cruella DeVillishly, with its splotch of ginger and streaks of black and cloud-cover gray. And certain other ideas might come to mind as one leafs through Joe Beef's Surviving the Apocalypse or Fergus Henderson's The Complete Nose to Tail. Yes, fine sir, I've got a recipe for rabbit leg confit with your name on it. My review of Tom Turner's Garden History is posted at Human Flower Project. I'm very grateful to the delightful, generous and patient Julie Ardery for the chance to read and write about this very cool book. Your garden will reveal yourself. Do not be terrified of that. The Essential Earthman was my introduction to the art of garden writing and to the wonders of Henry Mitchell. It's a book that I reread often, each time with familiar comfort and deepened appreciation: let me count the ways. And now, let us praise Henry Mitchell's paronomasia—that is, his hearty embrace of the pun ("The Wrongs of Winter, the Rites of Spring"). And his rimshot jokes, almost always at the expense of cats. And his metaphors, weirdly apt ("The flowers suggest a Santa Barbara girl who gave up tennis for macrame, that is, they look a bit odd, as if they had tried drugs and lived in Tangiers awhile"), and gleefully mishmoshed ("We begin, often enough, by hoping to knock the neighbors' eyes out with the largest mass of color since the lions ate the Christians"). And his allusions that remain just beyond my ken ("The first [Anemone blanda] out with me this year was the somewhat startling raw rich red 'Radar,' like a dandelion that fought at Shiloh, so to speak." ...that one I kind of get; "Once they saw we were not going to catch them for a Brunswick stew, and once they comprehended that the hounds were actually awake only on the rarest occasions, then the squirrels arrived like the guests at Andrew Jackson's cheese board." ...that one was beyond me until I looked here [—see "Anyone could come to Andrew Jackson's public parties..."]). And his sly riffing satire (fictional named varieties of Japanese irises "Moon over the Tortoise Cat's Ear', "Shimmering Brocade of July Charcoal Pit', and 'Glory of Titmouse Nest'). There are no photographs in The Essential Earthman, because they would be beside the point, and would only detract from descriptions like this: "The flowers [of the moonflower] are strongly scented, a trifle sickly in character. They are like thin strong silk, so white they appear to be illuminated, even on a fairly dark night." How confidently he strides in each of his pieces from wisecrack, to erudition, to self-deprecating admission, to the moral of the story, without missing a beat. When Henry Mitchell writes of the gardener's nearly universal love of the color blue, he theorizes that "there is some numinous aspect to blue and that other gardeners sense it as much as I do." That's what I seek and find whenever I read Henry Mitchell. If his writing were a color, it would be the color blue. We were at the music store before Thanksgiving to get the busted A-string on my daughter's cello replaced. While waiting, I leafed through a book of Thelonious Monk piano pieces. As one of the pages opened to that song, the plume of its tune filled my head. We got back to the car, and when I turned the key, WORT's afternoon jazz show was mid-song with "Autuor de Minuit" by Les Nubians, a hypnotic rendering of "'Round Midnight" with two singers, gently syncopated percussion, and acoustic bass. I've got the obsessive enthusiast's fancy for the variation (Gotta catch 'em all! ), whether in works that announce themselves as such, or when old standards are given new performances. It's satisfying to recognize the family resemblance in the disguised retelling of a work in a displaced genre, or to discover a new aspect of its essence as it's turned on its head (which is not to say that we shouldn't recognize and recoil from a wrongheaded adaptation as a wolf in grandma's bedclothes). I came upon another variation on the 'Round Midnight theme in a roundabout way when I read Bart Schneider's Beautiful Inez this summer, thanks to this recommendation. I feasted on the book's, uh, enthusiastic obsession with language, food and music, but also was taken by finding the book's family home set in San Francisco's Richmond district, evoking by idiosyncratic happenstance my own fond memories of a summer in a sublet apartment on 36th Avenue: being lulled into deep REM sleep by the lowing of foghorns in the misty night; dimly hearing the faraway barks of the sea lions on the Seal Rocks in the quiet predawn; spending Sunday afternoons in solitary bliss walking down Geary Boulevard all the way through the numbered Avenues, with Russian and Cantonese voices mixing in the air, or finding a deserted spot along the hills of the coastline from which to listen to Ella singing Gershwin on my mini-boom box while looking out at the ruins of the Sutro Baths. But back to the book, which heads toward its conclusion with the beautiful, and despairing, Inez hearing her husband arrive home from work. He's whistling "'Round Midnight", a tune new to her (he's a jazz aficionado, she's a concert violinist), but she's drawn to it immediately. We hear the song whistled again as Inez's husband teaches the melody to her, and as she plays and replays it on her violin, we start hearing the song ourselves, as it goes into perpetual-motion rotation as the soundtrack for the wordless, beautifully wrought, awful end to Inez's story. Although the melody of the song can be shaded in with any number of chord progressions, versions that simply take the dead man's walk all the way down the E-flat minor scale in the song's final measures miss the point; what needs to echo as the song ends is harmony in E-flat major. The Thelonious Monk Quartet plays "'Round Midnight" here (scroll down to the link). Once he called me into his room. The variations from the Opus 111 sonata were open on the piano. "Look," he said, ponting to the music (he had also lost the ability to play the piano), "look." Then, after a prolonged effort, he managed to add, "Now I know!" He kept trying to explain something important to me, but the words he used were completely unintelligible, and seeing that I didn't understand him, he looked at me in amazement and said, "That's strange." I knew what he wanted to talk about, of course. He had been involved with the topic a long time. Beethoven had felt a sudden attachment to the variation form toward the end of his life. At first glance it might seem the most superficial of forms, a showcase for technique, the type of work better suited to a lacemaker than to Beethoven. But Beethoven made it one of the most distinguished forms (for the first time in the history of music) and imbued it with some of his finest meditations. ...we see a complicated network of similarities overlapping and criss-crossing: sometimes overall similarities, sometimes similarities of detail. [....] I can think of no better expression to characterize these similarities than "family resemblances"; for the various resemblances between members of a family: build, features, colour of eyes, gait, temperament, etc. etc. overlap and criss-cross in the same way. [....] And the strength of the thread does not reside in the fact that some one fibre runs through its whole length, but in the overlapping of many fibres. Ludwig Wittgenstein, Philosophical Investigations (trans. G.E.M. Anscombe). Another autumnal equinox, another Rilke poem. As it did last year, Rilke's poetry came back into visible orbit for me via this summer's Token Creek Chamber Music Festival. The final program of the music series featured a performance of Peter Lieberson's "Rilke Songs", composed to five poems from Rilke's Sonnets to Orpheus (I:4, "O ihr Zärlichen"; II:1, "Atmen, du unsichtbares Gedicht! ; II:12, "Wolle die Wandlung"; II,5, "Blumenmuskel"; and II:29, "Stiller Freund"). Wanting to familiarize myself with the poems before the program, I found myself in the poetry stacks of the B&N, four different translations propped open to the first of the poems, and relied on instinctive reaction to choose Edward Snow's translation, which, after more hours in its company, still reads just right to me. I moved onto reading Reading Rilke: Reflections on the Problems of Translation by William Gass, which sends me into a little orbit of my own. The academic stilt of its title is misleading; this is a very personal and personable book. Rilke emerges as a three-dimensional human from the strokes of Gass's biographical sketch in the opening chapter. Somehow I'm unexpectedly relieved that the revered Rilke is flawed and real, not out of indulgence (I don't believe that it's okay to be a jerk so long as you produce great art) or sympathy (...nor that it's okay to be a jerk if you are oh so sensitive), but because unflattering truth is always better than hagiographical spin. Rilke, the poet of the Big Idea, believed in and worshiped passion...but mostly in his head. The existential losses of youth, love and life are celebrated in his poetry, but unsung, and perhaps unknown to the poet, are what he's lost by having passed up the chance to be a good father, and having never experienced an honest day's hard work. Why is it that Rilke's poetry is now even more appealing to me even after the unveiling of these hairy warts? Gass gets at this mystery in describing Rilke's poems as "lyrics that love, however pure or passionate or sacrificial, could never have achieved by itself...lines only frailty, terror, emotional duplicity even, could accomplish—the consequence of an honesty bitter about the weaknesses from which it took its strength." As advertised, the meat of Gass's book is the philosophy and practice of poetry translation. Gass lays out and examines selected stanzas in multiple iterations by several different translators (including himself), parsing them with time-honored methods of literary criticism, his own poetic sensibility, and sometimes just a little bit of Simon Cowell ("Leishman is sappy. 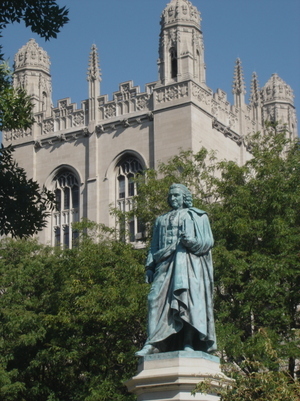 MacIntyre is insipid", he says about their translations of the first stanza of II:12 of the Sonnets). After reading Gass, I'm grateful for the bounty of English translations available on bookstore shelves, and hopeful that I can get closer to the essence of the elephant by putting all the blind men in a room and listening to each of their stories. Gass translates the first stanza: "The leaves are falling, falling from far away, / as though a distant garden died above us; / they fall, fall with denial in their wave." "Herbst" is recited and sung in German, set to acoustic guitar accompaniment, here. The camera can never go as far as the eye can see. How many times have I been thwarted from capturing a vision? The jeweled green glint of a hummingbird in blurred darting flight. Plumed ornamental grasses standing sentry in a hundred-foot formation. The sun of high noon so bright that everything is seen in an illuminated haze through a squinty gaze. The big sky in summer so cloudless and clear that you feel like you're standing at the bottom of a deep blue sea. The serendipitous glimpse of three clumps of three different agastaches in three different beds yards apart, echoing hullo-ullo-ullo in an unplanned but perfectly spaced diagonal. But even shots that adhere to the limits of light and dimension and yield pleasing results are, ultimately, no more than pretty pictures. Their beauty can be enjoyed, they may even evoke a memory or two, but they cannot send you into a time machine where you get to relive the experience you were trying to record. I certainly should know better; every parent learns this lesson a couple of hundred rolls of film or so into their first baby's first year; but the urge to catch and to keep that which cannot be possessed is one that I can overcome only with intense conscious effort, accompanied by much ersatz zen-talk. Gardening is not some sort of game by which one proves his superiority over others, nor is it a marketplace for the display of elegant things that others cannot afford. It is, on the contrary, a growing work of creation, endless in its changing elements. It is not a monument or an achievement, but a sort of traveling, a kind of pilgrimage you might say, often a bit grubby and sweaty though true pilgrims do not mind that. A garden is not a picture, but a language, which is of course the major art of life. Humoresque has been showing up a lot on the classic movie channel this summer, coinciding with the release of a new DVD set of Joan Crawford films. This movie's one of those that I'd always had a vague impression about but had never really watched all the way through until a few months ago. The movie's title (and not too much else) comes from the short story by Fannie Hurst, about a child prodigy whose gift is nurtured by his immigrant mother. After achieving fantastic success as a world-renowned concert violinist, he enlists to fight in the Great War. The story ends with his brief visit home on leave. He plays "Humoresque" for his mother ("It's like life, son, that piece. Crying to hide its laughing and laughing to hide its crying. "), and then a piece he's composed to accompany Alan Seeger's "I Have A Rendezvous with Death." He asks his childhood sweetheart to marry him, then leaves for Europe. The movie attempts melodrama of its own (boy from the slums meets violin, boy with violin meets rich girl, rich girl wins boy [mama has a fit], boy loses girl, boy keeps violin and mama), not quite as successfully. The violinist in the movie needs to be more of a wunderkind with a streak of mama's boy, but there isn't a grain of innocence in the world-weary John Garfield (whose character as a boy is played by Robert Blake). He's merely penniless and defiant, and completely unbelievable as he mouths platitudes about How Much His Music Means To Him and How Much Joan Crawford Means To Him. (However, although John Garfield is somewhat short for a leading man, and not at all handsome in my book, he is inexplicably, um, hot.) The movie is, of course, famed for its music (even inspiring this tribute album from Nadja Salerno-Sonnenberg), but the violin solos in the movie (although played ably by Isaac Stern's fingers and John Garfield's furrowed brow), are mostly of the histrionic diva genre, not so much my thing. Did I ever tell you I was in love once? It took me two weeks to get over her. I played all the thirty-two Beethoven sonatas. It took exactly two weeks. Are you sure there's nothing else I can do for you? Maybe you'd like to hear me play the Hammerklavier sonata—it only takes an hour, if I leave out the repeats. The level of musical perception among Holywood producers is, if anything, slightly lower than their perception of values associated with the other arts. [....] I recall the plight of one, whose social prestige decreed his presence at a certain Hollywood Bowl concert. It chanced that the important work of the evening was the C minor symphony of Beethoven, which he suffered in silence until the coda of the final movement. This has, as you will recall, what could be desribed as an 1805 Roxy finish, with the tonic and dominant chords repeated a dozen times, with flourishes. At each insistent recurrence of the tonic he half rose from his chair to facilitate his exit . . . also because he was bored. When the third series of tonic and dominant chords still left him short of the actual end of the movement he turned and muttered, "The rat fooled me again." Perhaps his most searching bit of musical criticism was propounded when he said to me dictatorially, "In my opinion"—marking the words carefully to allow the full weight of his thought to rest on me—"the greatest piece of music ever written is 'Humoreske.'" It was after such a characteristic demonstration that S. N. Behrman said of this producer, "Now I know why he can make those instantaneous decisions—he is never deflected by thought." Oscar Levant, A Smattering of Ignorance. Garden City Publishing Co., Inc., 1942 (reissue ISBN 0848821521). If the chicory of our roadsides is divided in the spring, it blooms in August rather than early July, and its sky-blue daisy flowers are to my mind quite beautiful. Henry Mitchell, The Essential Earthman. 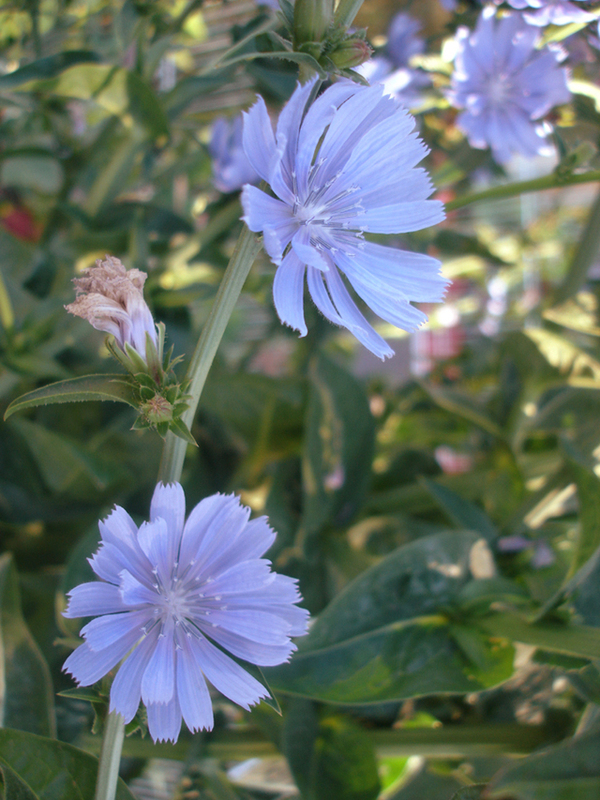 Chicory one: I'm not sure whether this is Cichorium intybus or Cichorium endivia. It has dandelion-like, medium-green leaves, not quite as curly as escarole, but suitable (in small doses) for including in a salad green mix. The flowers are the classic ice-blue of the roadside chicories. 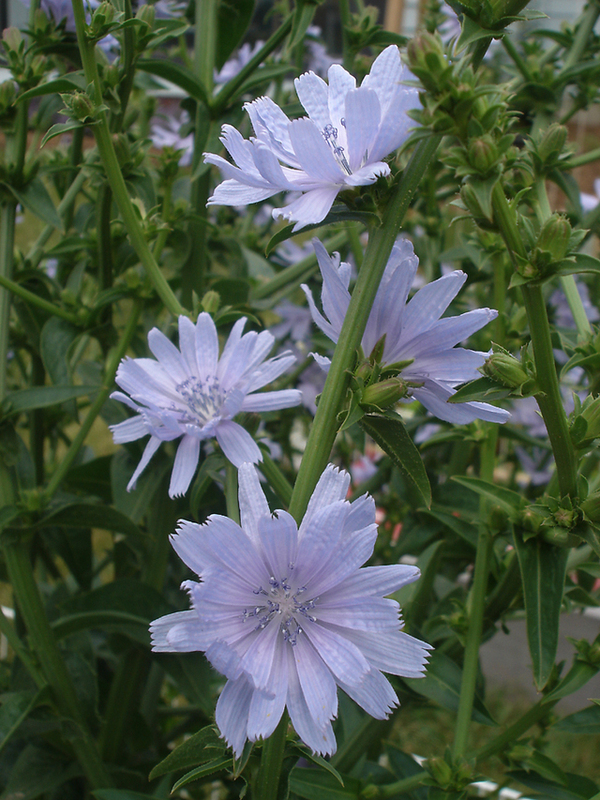 Chicory two: This is Cichorium intybus of the type that can be forced into Belgian endive heads. The foliage of this plant is thicker and a deeper green than that of "Chicory one", and although the blue of the flower is only a notch darker, it's almost periwinkle against the deep green leaves (this photo doesn't quite get the color right, alas). Passengers in my car were getting impatient with my habit of craning for a closer look at flowering chicory along the highway, and I really wanted the chance to be able to look at chicory flowers up close without convoys of semis whizzing by, so I introduced these into my vegetable gardens last year, starting from seed. Cichorium intybus is perennial, and Cichorium endivia is annual or biennial, so these grew like leafy salad greens last year, then overwintered and put up tall stalks this spring that began to flower a few weeks ago. The flowers open by the dozens along knobby-kneed stems first thing in the morning, and close up by early or mid-afternoon, followed by masses of new flowers the next day. 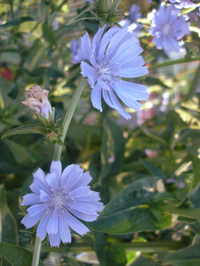 Chicory is known as a weed just about everywhere, but is also called "blue sailor weed" in some parts, a nod to botanical folklore that claims that the flower is the avatar of a lovelorn lass whose heart was broken by a sailor who returned to his true love, the sea. I think her name was Brandy. No harbor was his home. Dog days already. The peonies went from lush to louche in less than a fortnight. These days, all I need for my impression of Albert Brooks in Broadcast News is to step outside and stand stockstill. Just before the sun sets, the duskglow of the garden takes on a sepia-toned cast from the sodden, humid air, like a historical flashback in an artsy movie, or a fugue state. Pinks, yellows, reds, grays and blues buzz through the haze like old neon light fixtures. The other night, my husband was out in a stretch of the back border sequenced in jewel-toned 'Caradonna' salvia, yellow coreopsis, purple-bronze sedum, red-to-yellow blanketflower, magenta petunia, lemon yellow 'Happy Returns' daylily, pale blue catmint, this meadow buttercup, sunshine orange calendula, and blue-purple 'May Night' salvia. He was stopped at one spot, looking at the buttercup, and then the salvia, and then back and forth again. Look, he said. See how the blue looks after you stare at the yellow. He was right. In daylight, 'May Night' is pretty much a plain blue salvia, without the pizzazz of 'Caradonna' or the subtlety of 'Blue Hill', but it turned electric in that light with our little gaze-shifting exercise. Each portion now becomes a picture in itself, and every one is of such a colouring that it best prepares the eye, in accordance with natural law, for what is to follow. Standing for a few moments before the end-most region of grey and blue, and saturating the eye to its utmost capacity with these colours, it passes with extraordinary avidity to the succeeding yellows. These intermingle in a pleasant harmony with the reds and scarlets, blood-reds and clarets, and then lead again to yellows. Now the eye has again become saturated, this time with the rich colouring, and has therefore, by the law of complementary colour, acquired a strong appetite for the greys and purples. These therefore assume an appearance of brilliancy that they would not have had without the preparation provided by their recently received complementary colour. Gertrude Jekyll, The Gardener's Essential Gertrude Jekyll (selected and with an introduction by Elizabeth Lawrence). David R. Godine, 2000. ISBN 0-87923-599-3. Newly blooming: Ratibida columnaris (Mexican hat), Alcea rosea (pastel hollyhocks), David Austin rose 'Bibi Maizoon', Monarda didyma 'Jacob Kline', Hemerocallis 'Happy Returns' (daylily), Clarkia unguiculata (mountain garland), Linum grandiflorum (red flax, self-sown), Zinnia tenuifolia 'Red Spider' (self-sown), Nicotiana langsdorfii (green flowering tobacco, self-sown), Phlox paniculata (pink and 'Bright Eyes'), Asclepias tuberosa (white butterfly milkweed), Cichorium intybus (chicory), Aconitum (white monkshood), Heliopsis helanthiodes (false sunflower), Echinacea purpurea (white coneflower), Prunella grandiflora (selfheal).